As Kentuckians serving in the Confederate Army, the soldiers of the First Kentucky Brigade were “orphaned” from their home state, because the state government remained loyal to the Union and for most of the war, Kentucky was behind enemy lines. The Orphan Brigade could not recruit from home, the men could not go home on furlough, and even delivery of mail from home was uncertain. Some of the men were even under indictment by the pro-Union county governments at home. 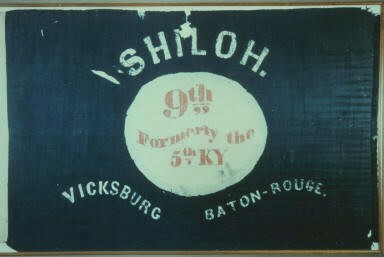 Two separate Confederate regiments were formed under the name “5th Kentucky Infantry” in November 1861. Having two separate regiments designated as the 5th Kentucky regiment was confusing. One would have to be re-designated. On November 14, 1861, Hiram Hawkins officially swore his regiment into Confederate service in Eastern Kentucky as the 5th Kentucky regiment. In late November 1861, Col. Thomas Hunt formally swore five companies into Confederate Service, under the assumption he would be able to raise enough additional companies to make a full regiment. These men were also officially sworn in as the 5th Kentucky regiment. In October of 1862, the dual 5th regiment name confusion would finally be resolved with Hunt’s regiment being now called the 9th Kentucky and Hawkins called the 5th Kentucky, since Hawkins had a full regiment and had applied earlier. 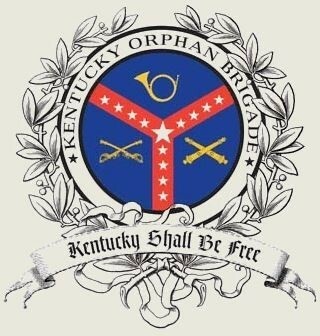 On September 4, 1864, only 500 men were present for duty in the entire First Kentucky Brigade. The 9th Kentucky Infantry was afterward ordered to Griffin, Georgia and converted to mounted infantry. The regiment was engaged in delaying tactics during Sherman’s March to the Sea, following him all the way to Savannah, Georgia, finally moving to Augusta, Georgia, in early 1865. The regiment’s last engagement was on April 29, 1865, in a skirmish near Stateburg, South Carolina. The regiment was ordered to Washington, Georgia and surrendered on May 7, 1865. Company B of the 9th Kentucky Infantry Regiment was mainly from the areas of Bardstown and Louisville. The men from Louisville were part of a pre-war State Militia company called the Citizens Guard. Simon Bolivar Buckner formed this company on his return to Kentucky after living in Chicago. Other members of this company called themselves the Nelson Grays. A common practice that many companies followed at the time was to name themselves after they home county. It is thought that the name, The Nelson Grays, was adopted in honor their home county, Nelson County. On October 2, 1861, the members of the Nelson Grays were sworn into service for a period of three years, or the duration of the war. The Citizens Guard arrived into camp on October 4th. They were sworn into service shortly after arriving. However, this was not the official regiment organization; these men were simply sworn into Confederate Service. On October 7th, 1861, Colonel Thomas Hunt began to organize the 5th regiment. Hunt formally swore five companies, including the Nelson Grays, into Confederate Service as the 5th regiment. In October of 1862, the regiment was re-designated the 9th Kentucky Regiment. In September 1864, the 9th began serving as mounted infantry. Following the battle of Murfreesboro, the Orphans were assigned to Gen. William J. Hardee’s Corps, and they were issued battle flags of Hardee’s pattern in early 1863. The 9th Kentucky survives today in the family of the final commander of the regiment. The unit designation on this flag is a graphic reminder that the 9th was designated as the 5th (9th Formerly the 5th KY) for its first year of existence.